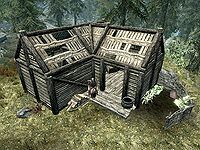 Anise's Cabin is a small, open cabin in Falkreath Hold near where the White River meets Lake Ilinalta. This cabin is very close to where you are after escaping from Helgen. It's also very close to the exit from Bleak Falls Barrow and The Guardian Stones. The sole occupant is an elderly woman named Anise. The entire structure is in a remarkable state of disrepair. The surrounding wilderness often contains friendly hunters or hostile bandits. The latter may engage her in combat, in which case she will use flame spells and may summon a familiar. It has one interior zone, the Cellar. There is a red mountain flower and thistle near her cabin and to the left of the entrance is a chair and pile of firewood, with a small vegetable garden to the right, consisting of three leeks, two cabbages, and two potato plants. To the immediate right on entering is a tall non-respawning cupboard holding an empty petty soul gem, a sample of hagraven feathers, a deathbell flower, a purple mountain flower and a sprig of snowberries. Opposite the entryway is a small wooden chair next to a few sacks and a barrel containing foodstuffs. To the left is a long wooden table pressed into the southern corner. On the table is a pheasant roast, a sheaf of wheat, two loaves of bread and a bowl of vegetable soup, with a garlic braid hanging from the ceiling above and hanging from a rack to the right is a rabbit and a bunch of frost mirriam. On the floor beside the table is a bottle of alto wine. 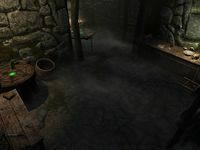 In the eastern corner and along the southeast wall is a single bed, that is marked as owned unless Anise is dead; then it is free to use. At the foot of the bed is small unit holding a copy of the Alchemy skill book Song of the Alchemists, with an apothecary's satchel beside it containing uncommon ingredients. Leaning against the unit is a long bow. Under the head of the bed is a small coin purse. To the left, against the west wall is a non-respawning dresser and a partially covered trap door with a novice lock leading to the cellar. There are a pair of hide boots next to the dresser, and there are leather bracers as well as a single red mountain flower on top of the dresser. Starting at the bottom of the ladder upon entering and moving around anticlockwise is a cupboard with a weak poison and a potent paralysis poison on top, with a barrel containing uncommon ingredients and a sideboard next to that. On the sideboard is a bowl of bone meal, a sample of hagraven feathers, a deathbell, a potion of health, and Anise's Letter that explains Anise is actually a witch who is trying to start a coven. Against the south wall is an arcane enchanter and to the left an alchemy lab. To the left of the lab, against the east wall is a small set of shelves holding another apothecary's satchel (containing rare ingredients), a flute, a drum and an iron dagger. Finally in the eastern corner are a few crates and food sacks. When you exit the cellar, Anise will become hostile and attack, shouting, "Fool! None may know my secret!" This will happen regardless of whether or not you entered the cellar undetected. When Anise dies, the bed becomes unowned. However, all other items remain owned, and taking them counts as stealing. Also, entering the cellar is always trespassing, which has little effect except that most followers will refuse to say anything but "You're not supposed to be in here" when you talk to them there. The cabin's basement is non-respawning, meaning that all containers are safe for storage. Several of the containers on the ground floor of the cabin are also standard safe containers (e.g., the cupboard and dresser). Be careful, as the barrel is not safe. Additionally, neither is the Apothecary's Satchel. This makes Anise's cabin a good starter home, since it has an alchemy lab, an arcane enchanter, a bed, safe storage, and is a fast travel destination. This page was last modified on 22 November 2017, at 19:16.